Underground oil deposit, historical artwork. 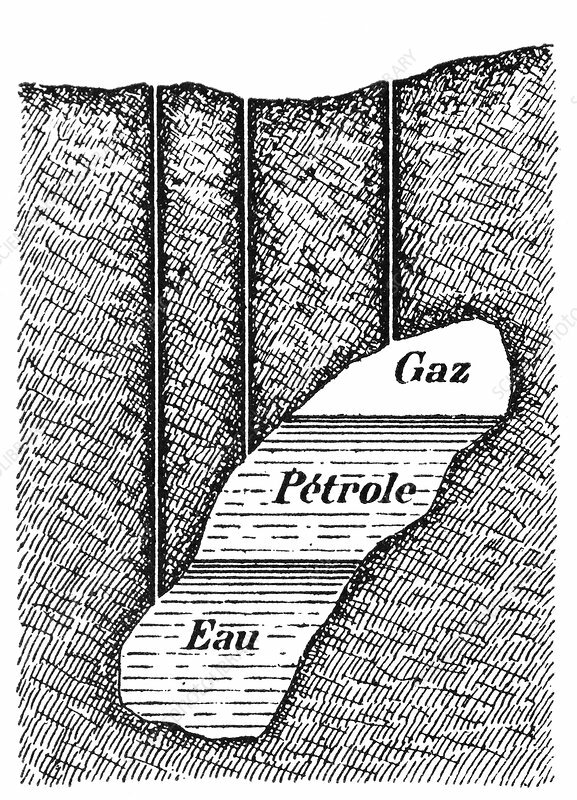 Shafts have been sunk from the surface to extract (from left to right): water, oil and natural gas. The labels are in French. Oil is a fossil fuel, rich in hydrocarbons, which forms from organic remains. Over millions of years, layers of sediment build up on top of layers of organic detritus on a seabed, compressing it and heating it until it turns into oil. The oil filters upwards and collects in pockets in the rock from where it is mined. Artwork from the third edition of 'Les Entrailles de la Terre' (1902) by French author Eugene Caustier.